What is a stroke? What is a mini-stroke (TIA)? What are the causes? Which is the worst type of stroke? What are the warning signs and symptoms of stroke vs. mini-stroke? How can you tell if a person is having a stroke or mini-stroke (FAST)? How long do the symptoms of stroke vs. mini-stroke last? Which side effects of stroke vs. mini-stroke are the same? What are the differences between the side effects of stroke vs. mini-stroke? Can a mini-stroke lead to other types of strokes? What is the treatment for stroke vs. mini-stroke? What is the recovery and prognosis for stroke vs. mini-stroke? Mini-stroke (transient ischemic attack, TIA) and stroke usually are caused by blockage of an artery in the brain, and less often by bleeding into the brain tissue. Strokes usually are classified as either ischemic or hemorrhagic. 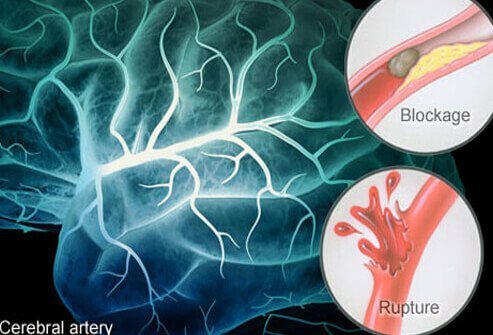 The causes of strokes and min-strokes (transient ischemic attack, TIA) are the same, however, blood flow leakage or blockage is temporary in mini-strokes, and blood flow returns spontaneously. In most strokes, blood flow does not return spontaneously. The majority of mini-strokes produce symptoms that are temporary, while the majority of strokes produce symptoms that are often long lasting, and cause permanent disability. Symptoms of a stroke include those of a mini-stroke, but the symptoms do not resolve. Treatment for mini-stroke usually is medication to reduce blood clot risk, reduction of other risk factors (smoking, for example) and follow-up to consider surgery if the cause is an aneurysm that occasionally slowly leaks blood. A stroke is a medical emergency and treatment depends upon the type of stroke. A stroke caused by a blood clot (ischemic) is treated with clot busting drugs or mechanical. Hemorrhagic (bleeding into brain tissue) stroke requires life-saving surgery, performed by a neurosurgeon. Mini-strokes symptoms are short-term that resolve, while strokes often produce long-term symptoms (disabilities). In mini-strokes, normal function returns quickly, but with strokes, normal function may never return. Recovery of normal function occurs quickly in mini-strokes, but strokes usually have an extended time for recovery that includes therapy. In mini-strokes blood flow returns spontaneously (the body resolves the blockage and/or leakage) and causes little or no damage to brain cells, whereas strokes do not have spontaneous blood flow return (the body does not resolve the blockage and/or leakage) and brain cells are permanently damaged and/or destroyed. Damage from a stroke is permanent, and an individual may never regain normal function of the part of the body affected. Other terms for stroke include cerebral vascular accident (CVA). Other terms for mini stroke include TIA, transient ischemic attack, and mini-stroke. Symptoms of stroke depend upon what part of the brain has stopped working due to loss of its blood supply. Often, a person having a stroke may have multiple symptoms including double vision, vertigo, and numbness on one half or part of the body. If you think you or someone you are with is having a stroke call 911 immediately for medical help. A stroke occurs when brain tissue becomes deprived of oxygen resulting in malfunction of the brain, and brain tissue is damaged or destroyed. A stroke usually is due to either blockage (ischemic) or leakage (hemorrhage) of blood flow by an artery that supplies oxygen rich blood to areas in the brain. If the extent of brain tissue damage is large, the person may die. A stroke is a medical emergency. It is the fifth most common cause of death in the U.S.
A subset of strokes is termed a transient ischemic attack (TIA) or "mini-stroke." In a mini-stroke, brain cells are dysfunctional for short period of time and produce symptoms similar to stroke. However, mini-stroke symptoms and signs usually are resolved within a short time (minutes to hours) (usually because the brain's arteries involved are only blocked, or may leak blood into the brain, intermittently). The answer to this question depends upon several factors. Many doctors would conclude that a large hemorrhagic stroke is the worst kind of stroke because they often are untreatable, and cause devastating damage to the brain from which there is little or no recovery. However, other types of strokes, for example, a blood clot in the brain, also can have similar devastating consequences. These strokes can result in disability and death just like hemorrhagic strokes. Some people consider being unable to care for themselves as a fate worse than death, and would say that survival with extreme disabilities (cannot feed themselves, unable to talk, cannot do any personal hygiene, for example) is the worst kind of stroke. Perhaps the worst kind of stroke is the one that occurs in yourself or your loved one, no matter to what extent is the disability. The term "FAST" is an easy way to help determine if a person is having a stroke or mini-stroke, and what you should do. FAST applies to both mini-strokes and strokes. The National Stroke Association and other organizations suggest that you use FAST as a way to remember what to look for, and what to do if a person develops any of these warning signs and symptoms of a stroke or mini-stroke. F stands for face. Ask the person to smile, if one side of the face droops, it is a warning sign. A stands for arms. Ask the person to lift both arms, if one arm drifts down or has difficulty moving, it is a warning sign. S stands for speech: Ask the person to repeat a simple phrase, if the speech is slurred or odd, it is a warning sign. T stands for time: If a person develops any of the warning signs, it is time to call 911 and have he or she evaluated for a stroke and/or mini-stroke at an emergency department. Stroke symptoms typically last more than 24 hours, and may or may not resolve, even with therapy. Some stroke symptoms may never resolve or get better. TIA symptoms last for a short time. Symptoms can begin to resolve in about one to five minutes, which is typical, but some may take about 24 hours to resolve. All of the signs and symptoms of mini-strokes usually resolve within five minutes; a few people resolve in less than 24 hours. Stroke side effects and symptoms last longer than 24 hours. Some may last a lifetime. The early symptoms of stroke may resolve partially, or never. When this happens, other signs and symptoms such as depression, muscle atrophy (muscle loss), and worsening of early symptoms may progress over time. TIAs or mini-strokes are considered by the American Stroke Association to be major warning signs of a stroke. For example, about 7% to 40% of individuals experiencing a stroke report having a TIA sometime before their first stroke. Moreover, about one third of people that have a mini-stroke have a stroke within a year after their mini-stroke. Strokes and mini-strokes are not treated exactly the same. Strokes are a medical emergency. Treatment for a stroke begins with a CT scan of the brain to help determine the difference between a blood clot in the brain or an artery rupture and hemorrhage. The type of treatment then depends upon the type of stroke. A mini-stroke also is a medical emergency. However, by the time the person receives medical care, the mini-stroke symptoms may have resolved, or are resolving. Hospitalization for TIA may be necessary for additional tests, and prescription medication and/or surgery may be necessary depending upon the cause. Mini-strokes may predict that an individual may (up to 40% chance) have a stroke within a year of the TIA. Mini-strokes or TIAs resolve spontaneously, and the individual recovers normal function quickly, usually within a few minutes up to about 24 hours without medical treatment. The prognosis for TIA is very good; however, TIAs frequently (up to 40%) are the way of telling you that in the next year you may have a stroke. The recovery and prognosis for a stroke is quite variable. Early treatment may increase recovery and improve prognosis. Unfortunately, the prognosis and recovery decline if a stroke is severe (a large area of brain tissue is damaged and/or dies) or the symptoms are present for more than a few hours and the individual is outside of the window for treatment. American Stroke Association. "Stroke Treatment." <https://www.strokeassociation.org/en/about-stroke/treatment>. American Stroke Association. "TIA (Transient Ischeimc Attack)." <https://www.strokeassociation.org/STROKEORG/AboutStroke/TypesofStroke/TIA/Transient-Ischemic-Attack-TIA_UCM_492003_SubHomePage.jsp#>. What is a stroke? Learn the signs and symptoms of a stroke, ischemic stroke, hemmorrhagic stroke, and other types of stroke. Please share your experience with stroke or mini-stroke (TIA, transient ischemic attack). It may help others. What warning signs and symptoms did you have with stroke or mini-stroke (TIA, transient ischemic attack)? What side effects have you or someone you know suffered as a result of stroke or mini-stroke? What treatment did you or someone you know receive for stroke or mini-stroke?